1987- Debut in 1st Division of Uruguayan Soccer League for Central Español. 1987- 1991 First Team Player for Central Español. 1992 – 1993 Transferred to “Club de Deportes Temuco” in Chile. 1994 – 1995 Transferred to “Colo Colo” in Chile. 1995 Transferred to “Union Española” in Chile. 1996 Transferred to “Club Deportes Concepcion” in Chile. 1997 – 1998 Transferred to “Club de Deportes Temuco” in Chile. 1999-2001 Transferred to “Club Everton de Viña del Mar” in Chile. 2002 -2004 Transferred to “Stallion of New Jersey” in U.S.A.
1991- American Cup in Chile (starter in all games played). 1992- Huelva Cup in Spain against Benfica, Chile, and Recreativo Huelva. 1993- International games against Mexico and Spain. 1992- Second Best Foreign Player in Chile (Don Balon Magazine). 1993- Awarded “Froilan Roa” for Best Foreign Player in Chile. 1994- Champion of Chilean Championship Cup with “Colo Colo”. 1999-2000- Everton de Viña del Mar is raised to 1st Division. Awarded Municipal Award, from Viña del Mar Municipality, two consecutive years. Working with kids of all ages since 2003. Working with U-11, U-12, U-14 and U-17 in PASCO Soccer Club. Summer and Winter camps with PASCO, New Jersey Select, and Real Madrid in Wayne, NJ. 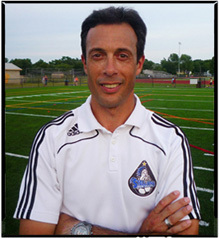 Giovanni Savaresi, former MLS Soccer Player and current broadcaster for ESPN. (917) 519-5958.